Mail order pharmaceutical sales are the largest growing segment in the drug retail industry, with over 240 million prescriptions per year . In 2010, approximately $182 billion dollars worth of pharmaceuticals required the maintenance of a specific temperature in order to preserve their potency and effectiveness . Biopharmaceuticals and vaccines contribute to a majority of shipments of temperature-sensitive pharmaceuticals, which are typically high in monetary value and have low product volume. With the surge in mail order shipments, increasing scrutiny by regulatory agencies, and the desire to lower costs, the need to develop an effective and reliable cold chain management system is critical. Multiple uncontrollable factors are present in mail order cold chain systems, where small errors can result in major cold chain failures, causing many industry challenges. In this article, we will present the most common problems seen over the last 20 years in the mail order pharmaceutical industry. The term cold chain in the pharmaceutical industry pertains to certain pharmaceuticals that require the conservation of a specified temperature range in order to maintain their therapeutic effectiveness. The required temperature range must be adhered to throughout all phases of these drug products’ lifecycle, from the time they are manufactured until the time they are administered to patients . Since temperature is one of the most important parameters to control during drug transportation, regulatory agencies have published guidelines on cold chain management. A break in the cold chain can result in temperature abuse and fluctuations such as cycles of freezing and then thawing, which can significantly diminish or even destroy the potency of certain immunizations . Between 75% and 100% of vaccine shipments are accidentally exposed to freezing temperatures due to breaks in the cold chain . Numerous risks are associated with transport logistics that could lead to a failure in the cold chain during the transportation and distribution process, including temperature fluctuations and packaging failure. A mail order shipment can encounter environmental temperatures that vary from 40°C to -40°C . Shipping packages for temperature-sensitive pharmaceuticals are typically designed with insulation and thermoregulators that can withstand specific temperature ranges and delivery windows. If the package is to be transported for longer periods of time in harsher temperatures than it is designed for, or if it is not packed according to the required packaging method, the packaging system will fail to maintain the necessary temperature range. Insulated packages, such as Styrofoam, limit the exchange of heat between the environment and the inside of the package, thus delaying the time in which the temperature inside the package reaches equilibrium with the external temperature . Thermoregulators, such as frozen gel packs, increase the thermal mass of the pharmaceutical products in order to reduce the rate at which the products reach equilibrium with the environment, while still providing the package with a cold bank. The cold bank helps increase the time the pharmaceutical products remain in the required temperature range when exposed to a warm environment. In addition, the cold banks allow for a greater difference in temperature with the incoming heat from the external environment, so that natural convection can occur inside the package and circulate cool air around the products. A mail order packaging system that provides successful temperature maintenance teeters on a delicate balance of packaging components. The systems are designed with the optimal combination of the insulated container, cold bank, and pharmaceutical products, as well as their positioning inside of the package. Any small modifications within the system can lead to a cold chain failure due to the sensitive heat transfer principles at play, causing all other cold chain initiatives to become irrelevant. 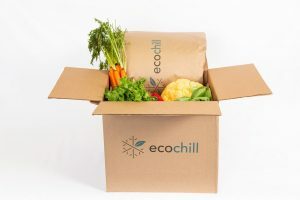 Once an optimal package has been determined for the unique environment in which it is being used, it is imperative that the procedures are adhered to each and every time in order to ensure the best chance of cold chain compliance. The following test data will demonstrate how small changes in a mail order packaging system can significantly affect the time versus temperature performance. The data presented were generated in our testing laboratory with the most common packaging components used in the industry. The insulated containers were 1.5-inch thick EPS square boxes. The cold sources used were 16-oz. and 24-oz. gel packs. Most mail order pharmaceutical shippers diligently choose packaging systems that are pre-qualified in order to feel reassured that they are meeting the regulatory temperature protection guidelines, yet the proper temperature may never occur due to human error or choosing a package that does not meet the specific needs of each facility. Each packaging supplier develops its own criteria for testing packages and the acceptable results. The supplier deems shipping packages as pre-qualified if they exhibit a high degree of assurance in meeting the acceptance criteria. It is imperative to discuss with the packaging supplier that the pre-qualified package was tested using the same procedures and payload that would be used at the mail order facility, in order to ensure the results can be replicated in the real environment of the facility. 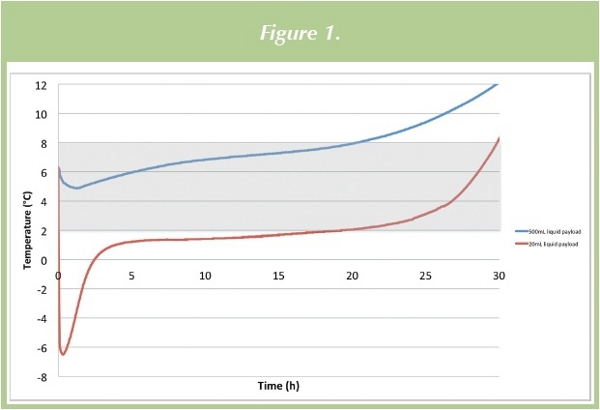 A packaging solution that was prequalified by a packaging supplier using the maximum liquid payload of 500mL was tested alongside the same packaging configuration, but utilized a standard pharmaceutical order of 20mL; this can be seen in Figure 1. 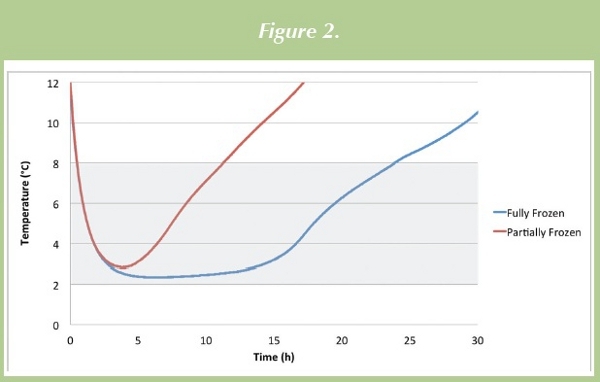 The pre-qualified solution as represented by the blue line shows maintenance of 2-8°C for 24 hours, whereas the red curve demonstrates the results seen using the standard order of 20mL worth of pharmaceutical product. Due to the small amount of pharmaceutical mass, the vials quickly reached freezing temperatures, potentially causing irreversible damage and reduction in potency. The small heat capacity makes the pharmaceutical products susceptible to rapidly reaching equilibrium temperature with the frozen gel packs. Pre-qualifying testing procedures using a high thermal mass of 500mL significantly reduces the potential to freeze the payload. Therefore, it is crucial to understand how pre-qualified solutions were tested and whether the results can be translated into similar results in each mail order facility’s unique environment and pharmaceutical order size. Once an optimal packaging system has been selected to work in the unique environment and conditions of each mail order facility, it is important that the procedures are followed each and every time in order to deliver the best chances of cold chain compliance. A quality assurance program, which guarantees that over time all the components remain consistent and the standard operating procedures are observed, will allow the packaging system to function properly. Ensuring the gel packs are conditioned to the proper temperature before packing is a crucial parameter to include in a good quality assurance program. Facilities either receive their gel packs frozen or in liquid state, but both circumstances can be at risk of using gel packs at not fully frozen states. Figure 2 demonstrates the effects of packing an order with partially frozen gel packs. The blue curve performs as expected using fully frozen gel packs; the internal temperature is maintained between 2-8°C for 24 hours. The red curve only maintains 2-8°C for 11 hours because the gel packs are partially frozen when packed. Although the partially frozen gel packs feel solid to the touch, the inside is not fully solid. Often, the gel packs are delivered to the mail order facilities in a case. When placed into the freezer in the case, they can take several days to fully freeze. The gel packs in the center of the case are the last ones to freeze, so even if the gel packs around the edges of the case are fully frozen, the center ones may be at risk for being packed in a partially frozen state. Oftentimes, the size of the gel packs and types of filler materials, such as bubble wrap, are changed. Even seemingly small changes can impact the temperature performance of the packaging system. A quality assurance program and standard operating procedures can work to eliminate the mistake of accidentally ordering the wrong gel pack size or using the wrong size gel pack. Various manufacturers produce gel packs with different dimensions even when the volume is the same, making it difficult to differentiate the volume of the gel pack by visual inspection. Changes in the size of the gel pack or mislabeling can lead to the accidental packing of the wrong size gel pack. Figure 3 shows the impact of using a 16-oz. gel pack instead of a 24-oz. gel pack. A 24-oz. frozen gel pack was used in the packaging configuration seen on the blue curve, which performs as expected by maintaining 2-8°C for 24 hours. In contrast, the red curve maintains 2-8°C for only 19 hours because a 16-oz. frozen gel pack is used inside the package. Studies have shown that a mail order package is rotated at least 24 times during transportation . Therefore, a mail order package must be able to maintain the proper temperature even with multiple rotations. A crucial factor in creating a package for shipping is developing a pack-out procedure that will still allow for proper temperature management, even during distribution. Due to frequent movements during transportation, it is essential that the internal packaging components and pharmaceutical products are stable in order to maintain the desired rate of convection. Figure 4 shows how the movement of frozen gel packs can result in dramatically different temperature fluctuations. The blue curve demonstrates a package that was well stabilized, which did not allow the frozen gel packs to move, whereas the red and green curves were packages that contained free space, thus allowing the frozen gel packs to shift. Frozen gel packs are dynamic; as they melt, they shift inside the package. 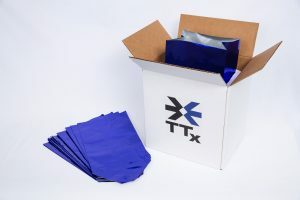 The addition of fillers—such as bubble wrap, air bags, paper, etc.—reduces the free space inside the package, resulting in a stable shipping package that will maintain the gel packs in the designated location as they melt and throughout shipping. There is a fine line between creating the perfect package and a package that allows for temperature excursions. Over-packing in order to prevent shifting of the gel packs can cause the insulated lid to not fully close, which can result in a package that does not maintain the proper temperature all the way to its destination. In addition, if the gel packs are not frozen flat, they are susceptible to forming bumps and becoming misshapen. Odd-shaped frozen gel packs can cause the packaging components to not fi t properly inside of the box, resulting in another opportunity for the insulated lid to close incompletely. An example of a packaging system with a partially open lid is seen in Figure 5. The blue curve is a mail order package with the lid fully closed, which properly maintains 2-8°C for 24 hours. The red curve is the same mail order package but with the lid opened by one quarter of an inch. The small gap between the lid and the external corrugate box reduces the time within the 2-8°C range by 10 hours. Although both packages started at the same temperature, the package with the lid ajar does not benefit as much from the initial cooling effect of the cold bank as the warm air from the environment moves into the colder internal environment. While most employees who are packing the mail order shipments have the best intentions to protect the pharmaceuticals, a simple lack of understanding of the sensitivity of the packages can lead to cold chain failure. Often, the orders are prepared and packed in the morning, but are not shipped until the late afternoon or the evening. In an effort to help keep the package cold, employees place the packed order inside of a cold room, but as seen in Figure 6, this attempt to help the package stay colder longer actually causes more damage to the pharmaceutical product. The blue line represents a package that is stored at room temperature in the mail order facility before shipping, resulting in the proper 2-8°C temperature maintenance for 24 hours. In contrast, the red curve was stored in the cold room immediately after packing and reached an internal temperature of -4°C within 2 hours. After 10 hours, it can be seen that the package was removed from the cold room, and a drastic warming occurred. Mail order packages that are not specifically designed for a facility to place them in the cold room after packing can potentially cause irreversible damage to the pharmaceutical product. 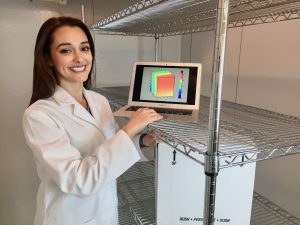 Designing the optimal mail order package for the shipment of temperature-sensitive pharmaceuticals is a difficult challenge in itself, as the drugs need to be protected from the heat as well as the cold. Designing a cold chain package that is unique to each facility’s operation process, shipping environment, and clientele is crucial to the success of proper temperature maintenance. Once an ideal cold chain package is designed, the development and implementation of a quality assurance program will help to ensure its integrity is sustained, since the variability of each component can significantly affect the performance of the solution. Strong standard operating procedures and training are also key elements to a successful cold chain mail order system due to the delicate balance of heat transfer principles at play within the package. Seemingly small and irrelevant actions put the cold chain package at risk for cold chain failure, and therefore, understanding the entire cold chain process will help enhance the integrity of a company’s cold chain mail order packaging system. 1. Gebbart, F. (2010). Mail order stirs pharmacy world. Drug Topics, 154 (3), 22-24. 2. Basta, N. (2012). Service and technology options multiply in cold chain. Pharmaceutical Commerce , p. 3. 3. Weir, E., & Hatch, K. (2004). Preventing cold chain failure: vaccine storage and handling. Canadian Medical Association Journal, 171-9. 4. Edstam JS, D. N. (2004). Exposure of hepatitis B vaccine to freezing temperatures during transport to rural health centers in Mongolia. Prev.Med, 384-388. 5. Matthias, D., Robertson, J., Garrison, M., Newland, S., & Nelson, C. (2007). Freezing temperature in the vaccine cold chain: A systematic literature review. Vaccine 25, 3980-3986. 6. Emond, J.P. (2007). Interactions between packaging component for pharmaceutical products. PDA Cold Chain Management Conference. Bethesda, MD. 7. Idiquin M. La distribution des médicaments en chaîne du froid: carnets pratiques. Rapport d’une commission SFSTP. S.T.P Pharma Pratiques 2007;7(3): 195-212. 8. Dea, S. (2004). Thermal behavior of shipping containers for temperature sensitive pharmaceutical products. Master Thesis: Laval University, 202 pages.